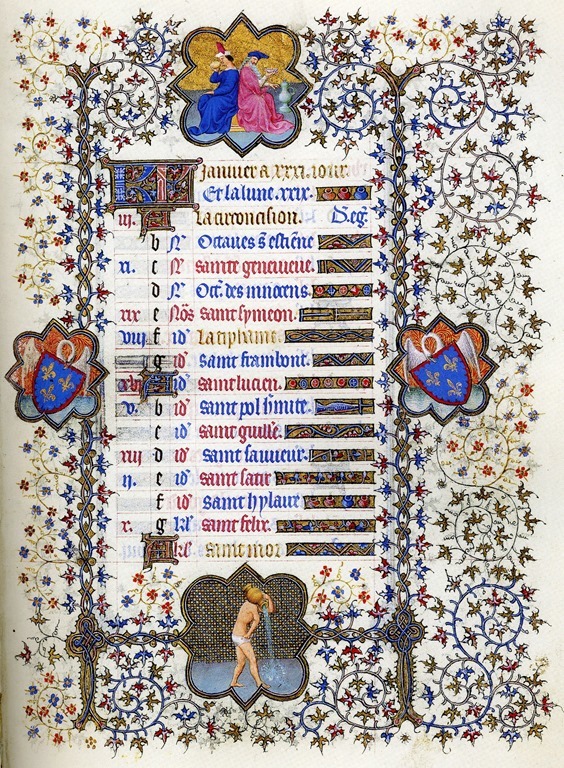 This is a Late Gothic illuminated manuscript page representing January in the Très Riches Heures du Duc de Berry. 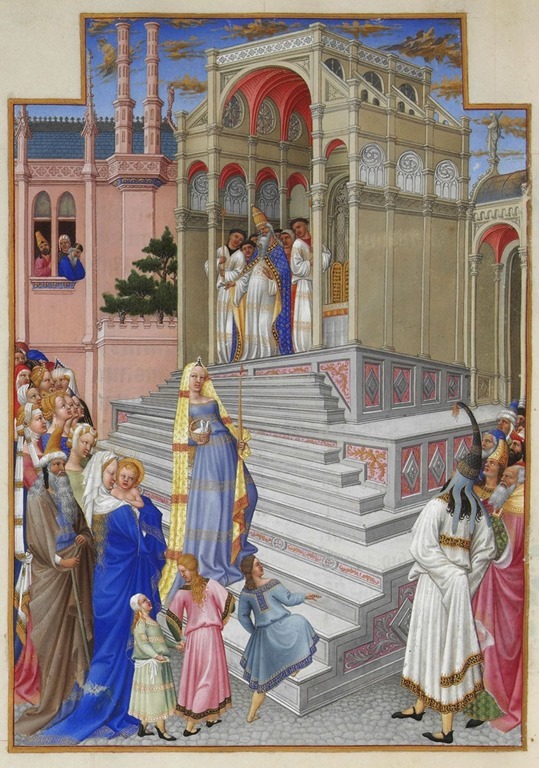 It was commissioned in about 1410-11, and features work by the De Limbourg brothers, Paul, John and Herman. It is preserved in the Musée Condé in France. It is considered the greatest of illuminated manuscript books. I never tire of its illustrations. 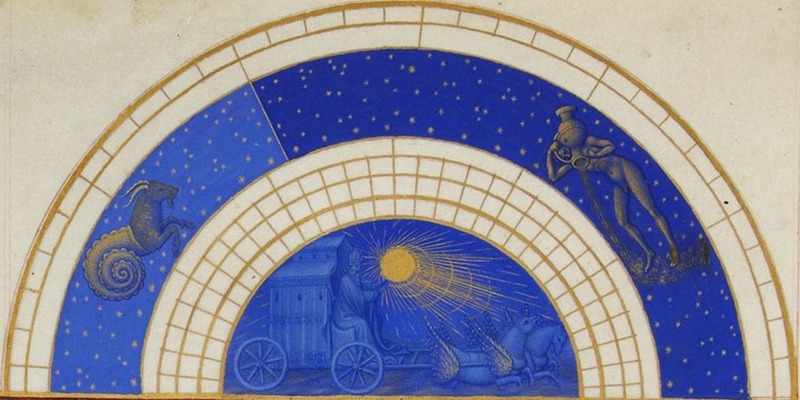 There is another manuscript called the Belles Heures du Duc de Berry in the collection of the Cloisters Museum of the Metropolitan Museum of Art, also by the Limbourg brothers. For many years, I have marked the seasons and its rhythms, even more so since retirement, and I happen to live in an area where the seasons are fairly well marked, each having its own well defined characteristics. These of course vary according to where you live. The good duke Jean, Duke of Berry, lived in northern France, and so the tasks and rituals are more applicable to that particular latitude, which happens to be where I also live in Canada, just above the forty-ninth. As represented here, January is a time of gift giving and feasting, the scene represented above has the Duke seated to the right (with a fur hat) at a banquet table, suggesting the feasting that took place on New Year’s Day, perhaps, when holiday gift giving took place. It was also a day for the renewal of contracts and expressions of loyalty and fealty. Generally, the time for feasting was from Christmas to Epiphany, the Twelve Days of Christmas. French Canadians still refer to this period as Le Temps des Fêtes. The period actually marks the days following the Winter Solstice, and is also a celebration of the return of light. The detail above shows the transition from Capricorn to Aquarius above the motif of the sun’s chariot. 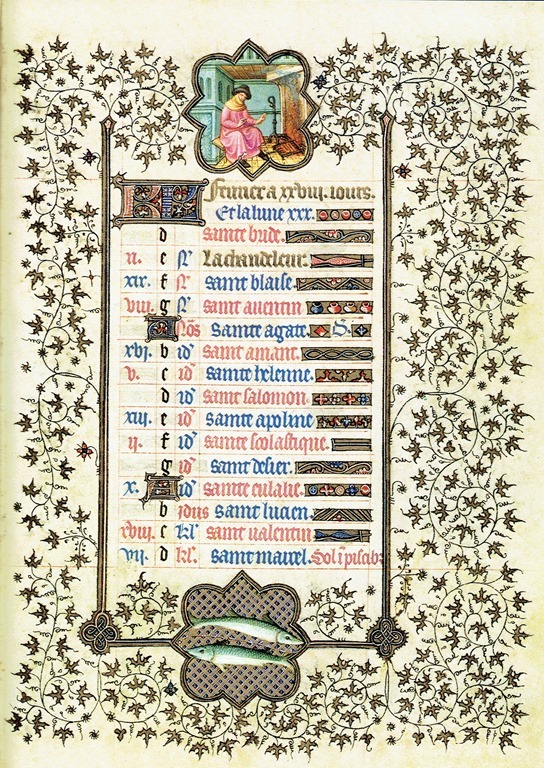 In the Cloisters manuscript, the month of January is represented by a list of its feast days. 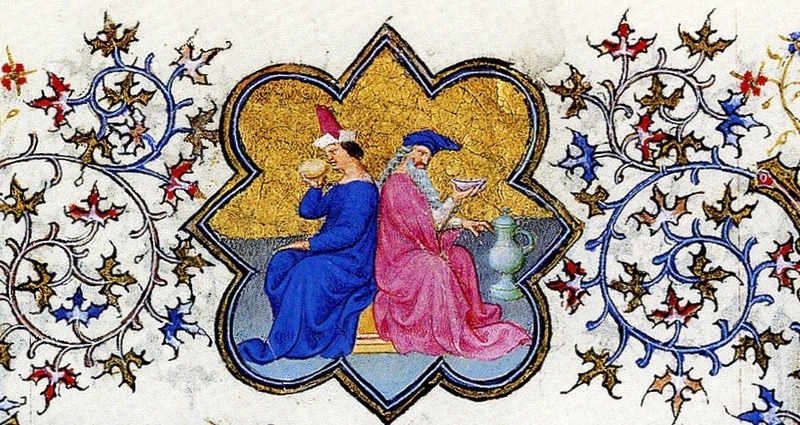 In the quatrefoil on top of the page, the Janus image of an old man sitting back to back with a younger man represents the passing of the old year to the new year. The Aquarius zodiac sign appears at the bottom of page. 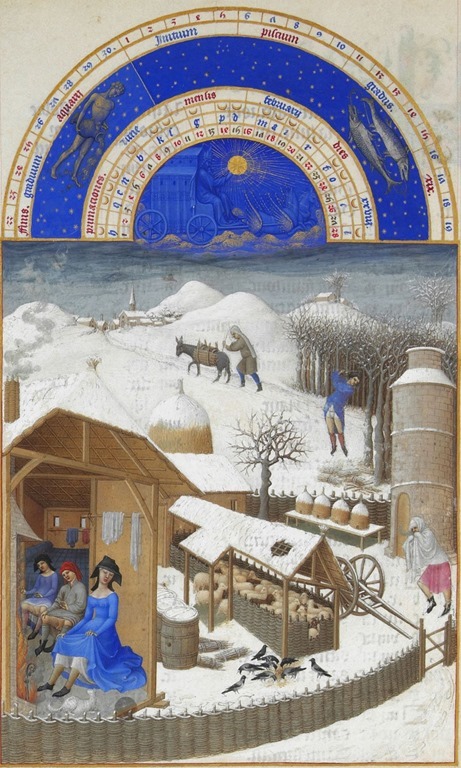 While most of the calendar pages of the Très Riches Heures feature the labours of particular months, this one seems to commemorate that time in deepest winter when rest from these labours takes place. The page for the month of February from the Très Riches Heures contains lovely scenes of winter in medieval France. One man is seen chopping down a tree for firewood, while another is blowing warmth in his hands as he prepares to go indoors. A third drives a donkey loaded with firewood towards a little village on top of the picture. Indoors, three people are warming themselves by a fireplace. Smoke comes out of the chimney. Outdoors, the sheep are huddled together in a covered enclosure while birds pick at grain. The beehives are covered with snow. Erwin Panofsky described this as the first winter landscape in the history of painting. 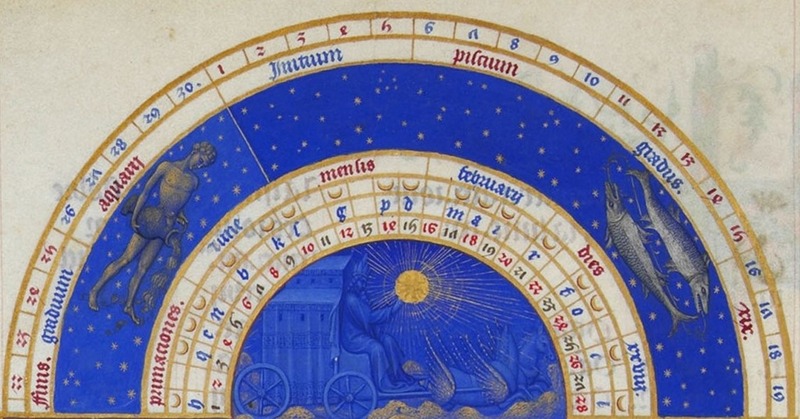 The top of the page shows the two zodiac signs of Aquarius and Pisces as the chariot of the sun moves through the heavens. 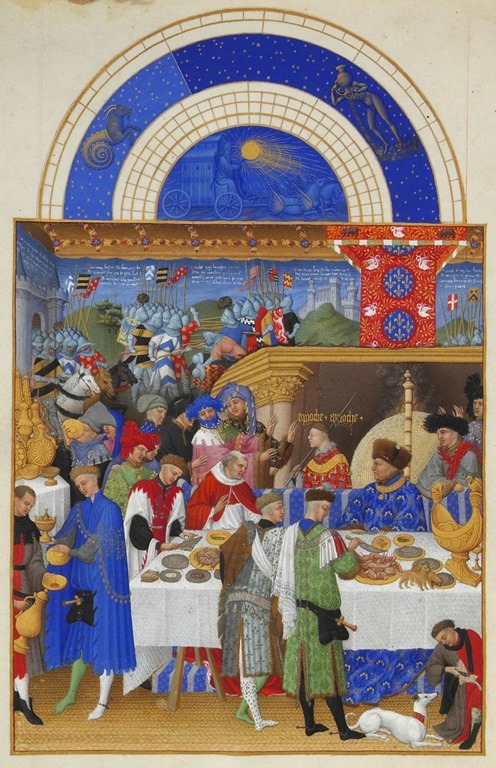 The Belles Heures manuscript lists the feast days of February, the principal feast being La Chandeleur, discussed in a previous post. The zodiac sign of Pisces is illustrated in the quatrefoil picture at the bottom of the page. 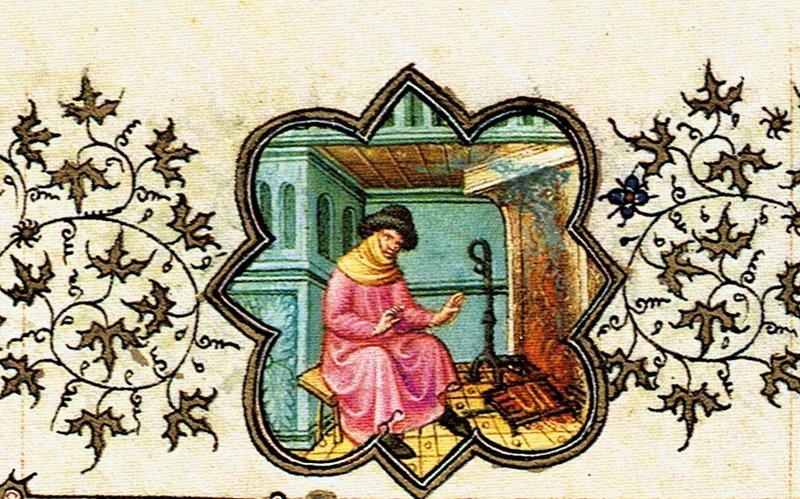 The small picture in the quatrefoil at the top of the page shows a man trying to keep warm by a fireplace. Smoke seems to escape into the room. Something is being grilled close to the fire, perhaps sausages. Since the manuscript of the Très Riches Heures also contains a terrific illustration of the Presentation of Jesus at the temple, or the Purification of the Virgin (2 February) I feel compelled to present it here, since I did not include it in my previous Candlemas post. The temple is presented in a high Gothic style. The Virgin approaches with the Christ child (bottom left), followed by Joseph. An attendant on the steps carries the sacrifice of the two doves. Within the temple above awaits Simeon, presented here as a Bishop attended by clergy. As for music associated with February, I can’t think of anything better than some of Bach’s Cantatas. There are various cantatas for Septuagesima, Sexagesima and Quinquagesima Sundays which inevitably occur in the dead of winter. The magnificent recordings of John Eliot Gardiner’s English Baroque Soloists and Monterverdi Choir present Bach cantata music for the entire year, grouping the cantatas by their feast days and Sundays. At this particular time, apart from the cantatas written for the aforementioned Sundays, the three cantatas he wrote for the Feast Day of the Purification of Mary (BWV 82, 83 and 125, recording Archiv 463585-2) seem particular appropriate, as they celebrate the coming of light. They also suggest, echoing Simeon’s words, that death is not such a bad thing as it leads to Light. Even for non-believers, this music and and meditation on the sung texts, can stand as metaphors for this particular time of the year, when warmth and light return to our lives.